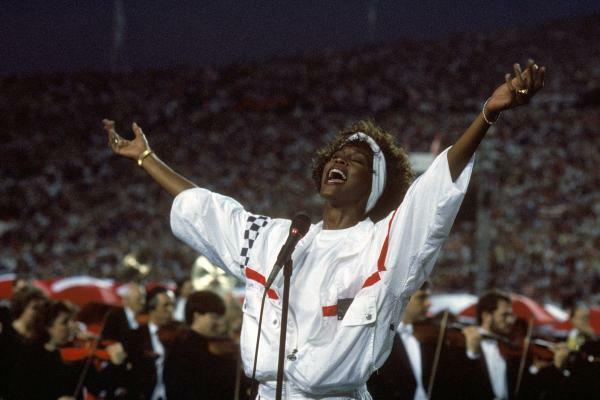 At Florida's Tampa Stadium in 1991, Whitney Houston delivered an iconic performance of "The Star-Spangled Banner" to kick off Super Bowl XXV. This week marked one of the biggest dates on the American sports calendar: the start of a new NFL regular season, with the Super Bowl champion Philadelphia Eagles hosting the Atlanta Falcons. But there was a third player in the game, too — a musical one. The national anthem, once again, is the focus of attention. Since 2016, the anthem has served as a platform for protest with some NFL players, and a symbol of division in the country. The controversy ramped up over Labor Day weekend with the revelation that Nike has hired original NFL protester Colin Kaepernick for a new campaign marking the 30th anniversary of the apparel company's "Just Do It" slogan. But it's merely the latest chapter in a more than 150-year connection between "The Star-Spangled Banner" and sports, one both powerful and controversial. 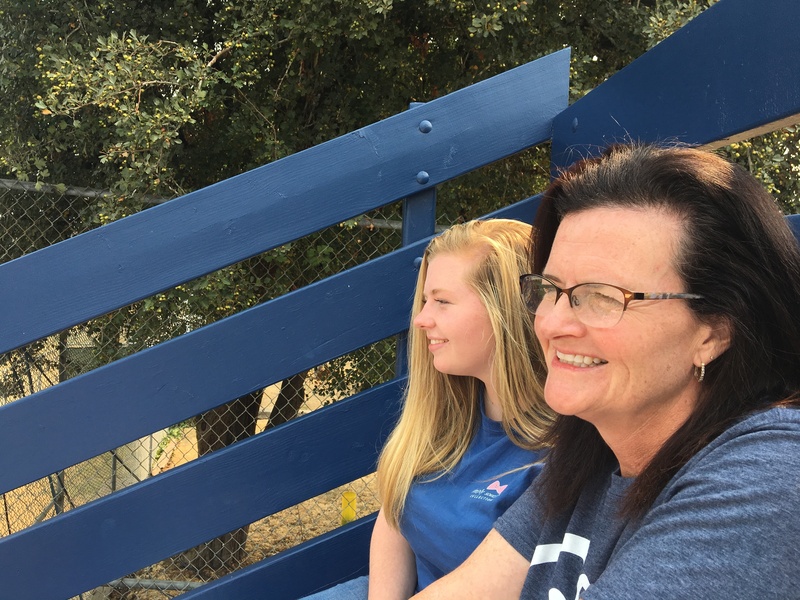 When 16-year-old McKenna Howard sang the national anthem at the recent Little League Softball World Series in Portland, Ore., her mother, Amy, was watching and listening closely from her bench seat in the stands. Amy Howard is a music and voice teacher from Wheelersburg, Ohio, who ends her classes with the song. She has performed it herself at Cincinnati Reds games and other sporting events. But for all her knowledge about and experience with "The Star-Spangled Banner," she is not sure about that historical connection between the song and sports. "I've never thought about why we do it," Howard says. "I like that we do it. It's good to stop and pause and remember why we are free to do what we're free to do." Sixteen-year-old McKenna Howard and her mother, Amy, at the Little League Softball World Series in Portland, Ore. this August. McKenna sang the national anthem at the event. Pausing for patriotism before the game has been a tradition forever, it seems. Anthem expert Mark Clague is one of the few who can identify when forever began. "The first time we have 'The Star-Spangled Banner' played for any type of sporting event," says Clague, "is actually May 15, 1862, in Brooklyn, N.Y."
Clague is a University of Michigan musicology professor who has spent a lot of his adult life learning everything he can about "The Star-Spangled Banner. The seed was planted when he was a kid. "1976, the American bicentennial, was my 10th birthday," Clague says. "I just really got into the flags and decorating my bike and the neighborhood parades and the tricorner hats and all of that." "The Star-Spangled Banner [tied together] all of that." It was born in 1814, when Francis Scott Key put words to a well-known melody. Forty-eight years later, on that May day in Brooklyn, the song first met up with sports, at the dedication of a new baseball field. "They hire a band because it's a big celebration," Clague says. "When you have live music in 1862, during the Civil War, you're going to play patriotic songs. So they play 'The Star-Spangled Banner,' sort of coincidentally. It's not part of a ritual; [it's] not played to start the game." Clague says the song was played at baseball games throughout the late 19th century — but only for opening day. It would take 50-plus years, and another war, for the anthem to become even more intertwined with sports. The 1918 World Series was not the first series to feature the anthem, but it was one of the most memorable. Babe Ruth played for Boston then, and the Red Sox were in Chicago taking on the Cubs for the championship. The crowd was flat: The Cubs weren't playing well, the weather was crummy — and, at a much more significant level, World War I still raged. During the seventh-inning stretch, the band struck up the anthem. "And one of the players on the field, who's in the Navy, just sort of snaps to attention," Clague says. "I even read some accounts where players marched military-style with their bats over their shoulders," says researcher Sheryl Kaskowitz, author of the book God Bless America: The Surprising History of an Iconic Song. "It really was seen as an important acknowledgment of the war." According to Clague, "the crowd responded [to the anthem]. It gets written up in the newspaper as this amazing moment that brings the stadium back to life at a time of despair, both sporting-wise and for the country. And the legend is, that inspires 'The Star-Spangled Banner' to be played at the next game and then back in Boston and then returns to Chicago. And becomes the thing from then on out." Twenty years on from that World Series moment, the song was a regular occurrence — not just in baseball, but at hockey and football games as well. Its spread was helped along in the 1920s by the increased use of public address systems, and fueled by surging patriotism in the run-up to the U.S. entering World War II. "The Star-Spangled Banner" became the country's official anthem in 1931. During those prewar years, Americans, who loved to go to the movies, got to know the song in newsreels that ran before the feature film. Superimposing the words over images of fighter planes in formation and charging soldiers, the spots helped solidify the anthem as an expression of military glory. Away from the theaters, the song was a natural fit at sporting events, with its celebration of heroism and the musical athleticism needed to belt out the song's highs and lows. "The incredible leap it takes to pull in a touchdown catch or to grab a grounder and turn a double play," says Clague, "has a kind of analog to those high notes in 'The Star-Spangled Banner.' "
As the song spread post-World War II, it became something people expected, and event insisted upon. If a team, a club stops playing the anthem, "somebody complains," Clague says. "It became a kind of obligatory, essential community need to have 'The Star-Spangled Banner' played at every sporting event, to the point where it became a focus of the game." In arenas where the anthem rang out, though, there were memorable renditions — from Whitney Houston at the 1991 Super Bowl to Marvin Gaye at the 1983 NBA All-Star Game. Of course, the anthem has been a battleground for dissent, too. "For this to be, indeed, the land of the free and the home of the brave," Dr. Harry Edwards says, "we would have to have arrived at that state of perfection that does not at this point exist." Edwards has been on those front lines for 50 years — as an athlete, sociology professor and active participant in the civil rights movement. His experience spans from the 1968 Mexico City Olympic protest during the anthem, mounted by track and field medal winners John Carlos and Tommie Smith, to his current roles as a sports consultant to the NFL and adviser to Kaepernick. The anthem, he says, always has been a powerful platform for protest. "The national anthem is about America," Edwards says. "It is symbolic of that aspiration for e pluribus unum — one out of the many. So the anthem becomes a forum to demonstrate against the contradictions to those professed aspirations." While the NFL and its players union work on a resolution to the debate, Edwards says he has suggested the league consider adding another anthem to the pregame — "Lift Every Voice and Sing," commonly called the black national anthem — as a next step. He says he hasn't heard back. Meanwhile, as another NFL season begins, the nation continues to wrestle with what the sports protests mean. Disloyalty to the flag, the military, the country? Or a true expression of freedom and hope that the United States can be better? This is where anthem expert Clague reminds us about, of all things, punctuation. In writing his lyrics for "The Star-Spangled Banner," Key ended the first and most famous verse — "O'er the land of the free and the home of the brave?" — with a question mark. "It's not an exclamation mark," Clague says. "It's not a period. It's not an ending. It's a question that needs an answer." Our reply, he says — to the song as well as to the protests — tells us a lot about who we are, and what it means to love a country and to be united. Today is one of the biggest dates on the American sports calendar - the start of a new NFL regular season. The Super Bowl champion Philadelphia Eagles are hosting the Atlanta Falcons, and the moment calls for music. CORNISH: Since 2016, the national anthem at football games has been a political flashpoint and a symbol of division in the country. But it's merely the latest chapter in a more than 150-year connection between "The Star-Spangled Banner" and sports. As part of our series American Anthem, NPR's Tom Goldman reports on a history that's both powerful and controversial. UNIDENTIFIED ANNOUNCER #1: Here come your Los Angeles Chargers. UNIDENTIFIED PERSON #1: Watch over the cowboys, the cowgirls. Please watch over our livestock. GOLDMAN: ...To the Little League pledge. UNIDENTIFIED PEOPLE #1: ...And strive to win. UNIDENTIFIED PEOPLE #2: ...And strive to win. UNIDENTIFIED PEOPLE #1: ...I will always do my best. GOLDMAN: Different moments, but there's one ritual they all share. GOLDMAN: That last singer, 16-year-old McKenna Howard, performed at the recent Little League Softball World Series in Portland, Ore. In the stands, her mom, Amy, listened closely. Amy Howard is a music and voice teacher from Wheelersburg, Ohio, who ends her classes with the national anthem. She has sung it at sporting events, but she's never thought about why. AMY HOWARD: I like that we do it. It's good to stop and pause and remember why we are free to do what we're free to do. GOLDMAN: Pausing for patriotism before the game begins - that's been a tradition forever it seems. Mark Clague is one of the few who can identify when forever began. MARK CLAGUE: May 15, 1862, in Brooklyn, N.Y.
GOLDMAN: University of Michigan musicology professor Mark Clague has spent a lot of his adult life learning everything he can about "The Star-Spangled Banner." It was born in 1814 when Francis Scott Key put words to a well-known melody. Forty-eight years later on that May day in Brooklyn, Clague says the song first met up with sports at the dedication of a new baseball field. CLAGUE: When you have live music in 1862 during the Civil War, you're going to play patriotic songs. And so they play "The Star-Spangled Banner" sort of coincidentally. It's not part of a ritual. It's not played to start the game. GOLDMAN: It would take another 50-plus years and another war for the anthem to become even more intertwined with sports. UNIDENTIFIED ANNOUNCER #2: Now, here's Ruth as a Red Sox pitcher. He broke in as a hurler in 1914. GOLDMAN: In the 1918 World Series, Babe Ruth's Boston Red Sox were playing the Cubs in Chicago. The crowd was flat. The Cubs weren't playing well. The weather was crummy. And on a much more significant level, World War I still raged. During the seventh-inning stretch, the band, says Clague, struck up the anthem. CLAGUE: And one of the players on the field who's in the Navy sort of snaps to attention. SHERYL KASKOWITZ: I've even read some accounts where players marched military style with their bats over their shoulders. GOLDMAN: Researcher Sheryl Kaskowitz has written about patriotic anthems. KASKOWITZ: It really was seen as an important acknowledgement of the war. CLAGUE: And the crowd responds. And, you know, it gets written up in the newspaper as this amazing moment that sort of brings the stadium back to life. UNIDENTIFIED ANNOUNCER #3: As usual at all World Series games, the crowd is standing up now for "The Star-Spangled Banner." GOLDMAN: By the time this anthem played at the 1939 World Series, the song was a regular occurrence not just at baseball but hockey and football games as well. Its spread was helped along in the 1920s by the increased use of public address systems and fueled by surging patriotism in the runup to the U.S. entering World War II. It became the country's official anthem in 1931 and a natural fit at sporting events with its celebration of heroism and the musical athleticism needed to belt out the song's highs and lows. GOLDMAN: As the song spread post-World War II, it became something people expected and insisted upon with the exception of pacifists who hated the war-like lyrics. Athletic arenas became stages for memorable renditions from Whitney Houston at the 1991 Super Bowl to Marvin Gaye at the 1983 NBA All-Star Game. MARVIN GAYE: (Singing) The land of the free and the home of the, home of the brave. HARRY EDWARDS: For this to be indeed the land of the free and the home of the brave, we would have to have arrived at that state of perfection that does not at this point exist. GOLDMAN: Of course the anthem has been a battleground for dissent, too. And Dr. Harry Edwards has been on those front lines for 50 years as an athlete, sociology professor and active participant in the civil rights movement. His experience spans the 1968 protests during the anthem by Olympic medal winners John Carlos and Tommie Smith to his current roles as a sports consultant to the NFL and adviser to Colin Kaepernick, who started the NFL player demonstrations during the anthem in 2016. The anthem, Edwards says, always has been a powerful platform for protest. EDWARDS: The national anthem is about America. It is symbolic of that aspiration for e pluribus unum, one out of the many. So the anthem becomes a forum to demonstrate against the contradictions to those professed aspirations. GOLDMAN: The nation has wrestled with what these sports protests mean - disloyalty to the flag, the military, the country or a true expression of freedom and hope that the United States can be better. This is where anthem expert Mark Clague reminds us of all things about punctuation. Francis Scott Key ended "The Star-Spangled Banner's" first and most famous verse, or the land of the free and the home of the brave, with a question mark. CLAGUE: It's not an exclamation mark. It's not a period. It's not an ending. It's a question that needs an answer. GOLDMAN: Our reply, he says, to the song, to the protests, tells us a lot about who we are, what it means to love a country and to be united. Tom Goldman, NPR News. Transcript provided by NPR, Copyright NPR.